The menu is at the top of the screen and looks like this. The Mudeford Ferry operates between Mudeford Quay and the Beach at Mudeford Sandbank approximately every 15 minutes during British Summer Time, which is from Easter to late October, weather permitting. We will also operate at Weekends and School Hoildays in the Winter months provided there is a favourable forecast, the sun is shining and the wind strength is reasonable. Check our facebook page or telephone 07968 334441 for up to date information. 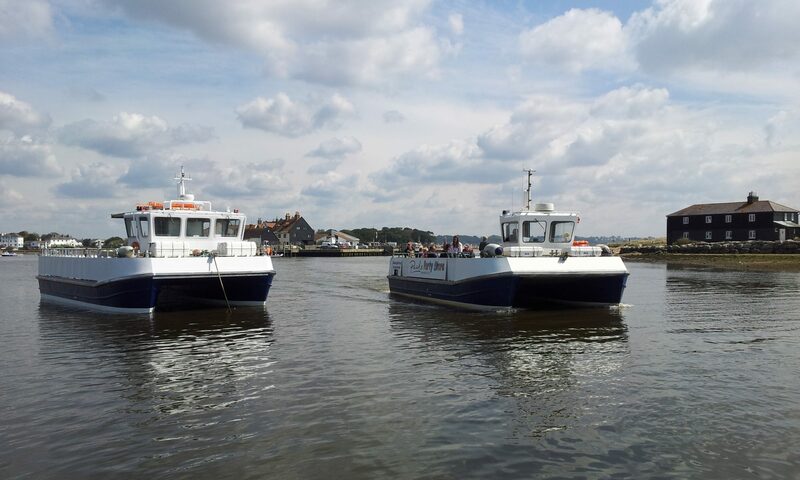 The Mudeford Ferry is based at Mudeford, Christchurch, Dorset on the south coast of the UK. London 100 miles, 25 miles west of Southampton and 5 miles east of Bournemouth, postcode BH23 4AB. Mudeford Sandbank and Beach is the relatively unspoilt strip of land adjoining Hengistbury Head. On one side is the sea and on the other Christchurch Harbour. Picturesque beach huts bask in the sun, flanked by unspoilt beach. Choose to sit and watch the yachts in the harbour, the waves gently rolling in from the sea or visit the site of the ancient ironworks on Hengisbury Head. There is a cafe named appropriately the Beach House and a two hundred year old building called the Black House, which has been recently made into holiday flats. From Mudeford Sandbank you can travel up the river using the vintage boats operated by Bournemouth Boating Services to Christchurch Quay for Christchurch Town Centre, to Wick for Captains Club Hotel and onwards to Tuckton for Tuckton Tea Gardens. There is a Land Train that connects the Mudeford Ferry with Southbourne and ultimately Boscombe and Bournemouth. There is a Car Park at the Southbourne end of the Land Train. Some people make a round trip starting at Mudeford Quay and taking the ferry to the Sandbank, walk or use the Land Train to Wick, Wick Ferry to Christchurch and then bus or walk to Mudeford. Use the Google Map for directions. We welcome bicycles. Adult bicycle £1.50 Child bicycle 70p. Ferry times are approximate only. Please check the “actual“ ferry times on the signs on Mudeford Quay and on the Sandbank pontoon. On rare occasions Ferry Times may change without notice. Times may be adjusted in inclement weather. If conditions deteriorate we may stop running. In extreme weather conditions we will endeavour to run ONE BOAT ONLY at the scheduled start time and then cease operating. Length 6 metres, beam 2.2 metres and draught 0.5 metres. The Net Gain is used for harbour trips and backup ferry. We operate everyday in British Summer Time, which is from Late March to late October. We also operate Winter Weekends weather permitting. When the flag is flying – we are running. “School Holidays” dates are as per Highcliffe school. Our definition of *weather permitting* is if there is a favourable forecast, no persistent rain, the sun is due to shine and the wind strength is moderate and wind chill temperate above zero. Please check the “actual” ferry times on the signs on Mudeford Quay and on the Sandbank pontoon. Times may be adjusted after the ferry starts in inclement weather. If conditions deteriorate we may stop running. In extreme weather conditions we will endeavour to run ONE BOAT ONLY at the scheduled start time and then cease operating.